Inkfish: Why Don't Woodpeckers Get Concussions? To help protect our big, fragile brains from trauma during sports, why not turn to another animal that voluntarily smashes its skull into solid objects? The woodpecker hammers its beak into tree trunks twelve thousand times a day at at fifteen miles an hour. In so doing, it drills out nests, finds tasty bugs, and does not (as far as one can tell) give itself brain damage. What's its secret? Lizhen Wang at Beihang University in Beijing led a study to find out what makes the woodpecker so resilient. The team used Dendrocopus major, the great spotted woodpecker, which is common in China. For comparison, they also studied the Eurasian hoopoe,* a relative that pecks soft soil instead of wood. With the birds caged, the researchers used high-speed cameras to record their pecking motions and sensors to measure the force with which the birds struck the metal cage or a piece of foam. They also took detailed scans of the birds' skulls, examining them at a microscopic level. 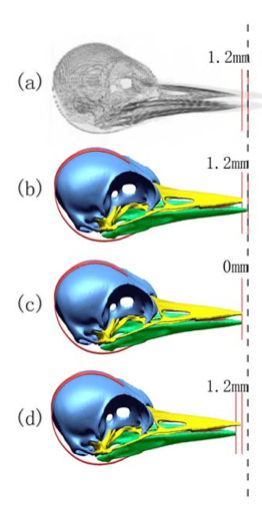 After mechanically testing pieces of woodpecker skull and beak, the researchers used those results to create a computer model of a woodpecker head. Then they virtually smashed the model head into a tree trunk, tweaking different parameters and observing the effects. Some of what Wang found in woodpeckers is of no immediate use to athletes. For example, some of the woodpecker's sturdiness comes from the hyoid bone, a nifty sling-shaped structure that extends from the top of the head through the skull to the nasal cavity. This bone (letter b below) only exists in woodpeckers. Additionally, the woodpecker's beak, with its uneven upper and lower parts, is calibrated to absorb much of the blow. 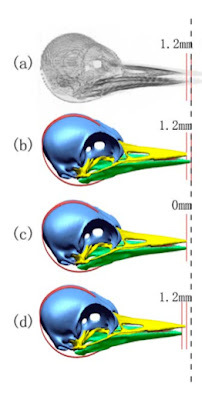 Humans can't very well insert stabilizing bones behind our faces or grow beaks that absorb an impact like the front of a car. But findings about the woodpecker's skull bones might be more useful. Compared to the hoopoe, the brain of the woodpecker is packed tightly in dense bone. The hoopoe's skull contains more spongy bone, an airy-looking material made of branches surrounding pockets of space. The woodpecker's spongy bone has less space inside it and looks compressed, like sheets of bone stacked on one another. The woodpecker skull is preferentially padded with this spongy bone at the forehead and the back of the skull. If we can incorporate some of the woodpecker's evolved technology into future helmets, we may be able to better protect ourselves from the recreational activities that threaten our brains, from field sports to bicycle riding. We may be the more cerebral species, but the better-protected birdbrain could help keep us alive. *Linguistic point of interest: "hoopoe" is from the Latin upapa, an imitation of the bird's call. That is a great article, you would think by now we would have better helmets to protect. With the helmets of today is there studies to to why there is still concussions? Is the hit in a certain area? The force? I would say some sort of airbag device that could be used over and over again maybe. A lot of the issue can be summed up in the one word "deceleration". When a football player rams his head into another player, it stops suddenly, but his brain doesn't -- it shoots to the back of his head and slams into his skull. Helmets protect poorly against this. Woodpeckers apparently reduce the effects of deceleration with their shock-absorbing bill and springy hyoid bone.